Christmas is exactly one week away but our #healthiestholiday recipes are going strong! This is going to be a crazy week between working, finishing up some last minute gifts, and baking all of these delicious recipes! None the less, this is the most wonderful time of the year and I'm definitely looking forward to the holidays. As much as I would love to chat your ear off, I have three more cookie recipes that I need to publish this week so my posts are going to be a bit shorter for the time being. I've had a ton of fun trying to "healthify" our favorite classic holiday treats and I'm so excited to add these all to our archives. I love treating myself during the holidays, but I also love listening to my body and saying no to ingredients that don't suit me. My goal for this #healthiestholiday collection is to simply remind you that you can enjoy sweets, while also taking care of your body. 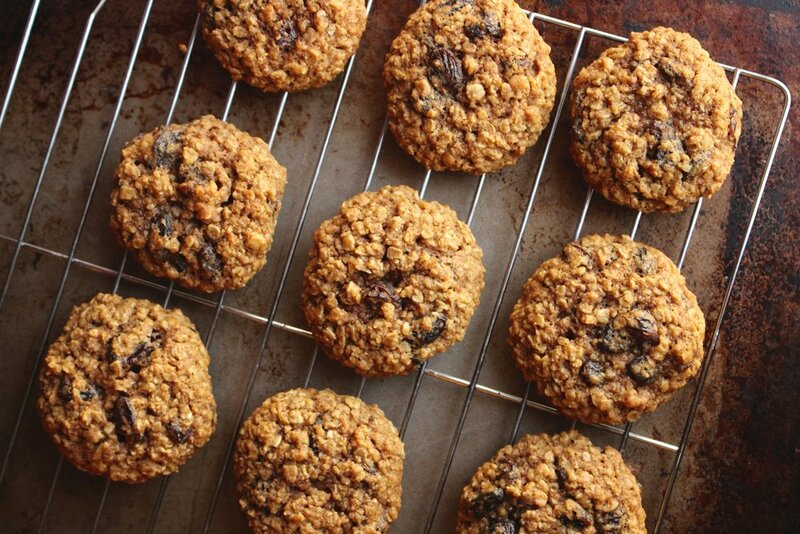 Oatmeal raisin cookies just so happen to be one of my very favorite cookies. I could eat them in the morning with coffee, after a workout for those post-workout carbs, or even to crush a late night sweet tooth craving. Unlike most cookies, they have the perfect amount of sweetness without being over the top, not to mention actual oats and fiber! Oatmeal raisin cookies are a win-win in my book, so I couldn't help myself when it came to making a healthier version for this years #healthiestholiday! This recipe only requires all natural sugar such as maple syrup or honey, and uses unbleached unprocessed whole wheat flour. You can omit the flour completely, in which I also love and do quite often for my Cinnamon Raisin Breakfast Cookies! This recipe is definitely more "cookie like" and I would still chalk it up to a dessert recipe. With that being said, if you have any questions as to how you can make this healthy version even healthier, feel free to leave a comment or question below. I would be happy to accommodate to any and every foodie preference! In a large mixing bowl, cream together softened butter, maple syrup, molasses, and two eggs. In a separate mixing bowl, measure out the flour, quick oats, baking soda, cinnamon, and salt. Carefully pour the dry ingredients into the wet and begin to fold together. Once the batter is generously combined, add in 1 or 2 cups of raisins, depending on how raisin-y you like your cookies. Continue folding, making sure not to over mix and squish the raisins. Place the oatmeal raisin cookies 1 inch apart and bake for 10-12 minutes, or until the cookies have spread and are golden in color. For a softer cookie, bake for 8-10 minutes and let cool completely before serving. I hope you love this recipe as much as we do!